Arthritis is a collection of diseases that affect the bones and joints. Osteoarthritis is the type most commonly thought of as ARTHRITIS. The suffix "itis" usually indicates inflammation, but in OsteoArthritis it actually means a degeneration of joint tissue. This can cause inflammation and pain, especially at its end stages, but can be painless as it develops. A common misconception from patients visiting Sydney Wide Chiropractic about arthritis is that it is caused by overuse of a joint. When seen on an x-ray the joint space appears as though it has been worn away from too much pressure and time. In actuality, it is from a lack of use that causes arthritis in joints. If you were to wear a cast on your elbow for several years, arthritis would set in, degenerate the joints and eventually fuse the joint spaces together! The spine is especially sensitive to arthritis. This is because the spine is made up of so many joints that immobility and dysfunction can occur without notice. After a trauma a vertebral unit (two vertebrae and the joint between them) can be knocked out of the proper alignment, causing joint dysfunction and immobility. When the joint stops functioning arthritis sets in just as if the joint space were wearing a cast. Over time the space degenerates and the body attempts to fuse the spaces together. 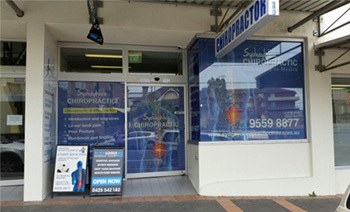 For more information or to schedule a consultation with one of our Chiropractors at Sydney Wide Chiropractic Marrickville 95598877 to attain help with arthritis pain.